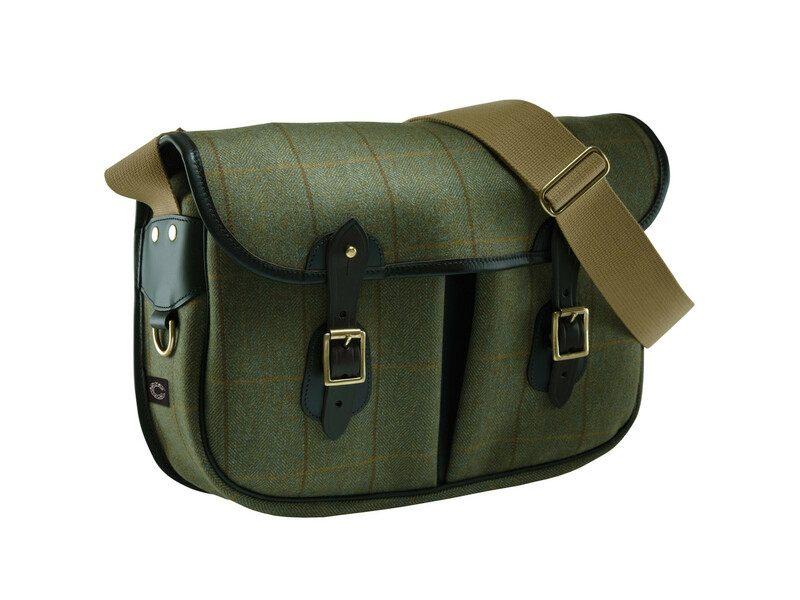 Helmsley Tweed carryall bag is available in two sizes and has a good-sized main compartment, a full-width rear pocket and two leather-trimmed pockets on the front with flap closure. Helmsley Tweed carryall bag is available in two sizes and has a good-sized main compartment, a full-width rear pocket and two leather-trimmed pockets on the front with flap closure. The cotton webbing shoulder strap is fully adjustable and a comfortable 2" wide. Access to the bag is by using either the solid brass buckles or the quick-release brass studs. Medium - W13 x H10 x D3"
Large - W15 x H11 x D4"
Helmsley Tweed Range This collection used the finest 100% pure new wool, woven in Scotland to produce a soft, high grade tweed of the quality designed originally for bespoke suits and overcoats. The tweed is laminated with natural rubber to provide 100% waterproofing, greater weight and increased durability. The Helmsley tweed collection has vegetable tanned bridle leather straps and trims along with solid brass hardware and cotton webbings; it carried hand stitched detail throughout. These stylish bags are as at home in the town or city as they are walking on the moors or out in the field.